I have renewed, revamped my podcast which now includes video! In this episode I will talk about why I rebranded from Rulebreaker Lifestyle to Fit Faith Freedom Podcast. This episode is brought to you by the Beautiful Power Retreat . Apply to attend this 6 hour transformational retreat on Saturday, July 14th in Raleigh, NC. How can we serve better through listening to our spirit & taking action? A lot of things get in our way whenever we are called to do something. I took a season off on my podcast, last December, to take BIG action on myself! I hired a relationship and a business coach to get really clear on message. Then I took my first mission trip to Costa Rica which was life changing! If you are called to do something that will make an impact then take big action! At that time, I stopped and listened. Sometimes you just know that you are going down a path and it’s not the right path for you. It just doesn’t feel right. Listen to that! So, I prayed, meditated, and got really clear on how I wanted to feel. Where I was at, at the time of my last podcast 6 months ago, was not how I wanted to feel. I was grinding and hustling and I felt so much resistance. I revisited and reached out for help. That help led me to the next thing, the next step. So, if you’re somewhere saying, “I don’t know what the next step is. I know I’m supposed to being doing more. I know I want to keep growing”, stop and listen. Just take the next step! The mission trip for me, changed my life and my business! I didn’t even intend to go there but, I went there on faith. (I’ll share more about my trip on social media and in my next blog post.) What really changed for me was focusing on gratitude. I also focused on, now what I feel is an obligation to share with the world, my gifts. Everybody has gifts! I have an obligation to keep growing and teach others. I believe WE ALL have that influence in our lives whether it’s with our kids or our family. We have that responsibility to show up as the best version of ourselves. We are continually working through that process. What to expect on the revamped Fit.Faith Freedom podcast? It’s really coming from a place that is more feminine. This is something I learned 2-3 years ago and I never really understood it till now. There’s a masculine and a feminine energy. The masculine energy is really prevalent in our society. It’s all about getting things done and grinding it out. Hustle, hustle, hustle! That was the space I was living from. In that mindset, you’re pushing and grinding. That’s how I was with my nutrition. I was trying to stick to a diet and do it all on my own strength. I think God gives us these signs and these feelings or intuitions of, “this may not be right”, and we just keep grinding. Of course, we’re going to get opposition! Just today, so many things were setting me up for opposition from what I knew what my mission was today. Sometimes there is opposition and we have to work through it and sometimes no matter what we’re doing, it feels hard. It shouldn’t be like that! We should have this internal joy! We should have this vision of what we’re going for, whether it is a transformed body, a transformed relationship but, each day we are working to get closer to that vision and we’re getting fulfillment along the journey. I was working from this masculine energy and wasn’t getting fulfillment. So, I shifted and spiritually gave it up and asked, “what am I supposed to be doing?” I felt in my spirit that I had all this time and I was called to go in a mission trip. I went to Costa Rica, which was one of those places I’ve been wanting to go to! I was there for 5 days working with women in a sewing ministry and it was transformational! It was so simple! I came back with gratitude. The next step in your journey, in my experience, is start with gratitude with where you are. A lot of my clients are moving towards their goals but, they’re not there yet. So, take a look back at how far you’ve come and keep taking that step. Make sure you’re enjoying the journey! If you’re not, check in and see what you can do to start enjoying the journey more. For me, it was getting clear on my mission because I was coming from a rulebreaker lifestyle. I still like that! I still like questioning of our limited beliefs and asking, “I have been doing this forever, do I have to continue doing it the same way?” Can we change? Can we shift gears? 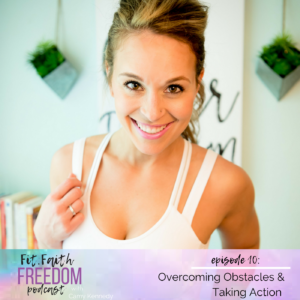 When I cam back from the mission trip, I heard it clear and knew I needed to change the podcast name to Fit Faith Freedom. I knew I needed to call my podcast Fit Faith Freedom. I had the idea to call my podcast that in the beginning but, I went and did my own thing. I went the way of being masculine and talking about business and the freedom lifestyle. Then God thumped me on the head and told me, “I told you to do it this way before and you chose to do it your own way and you were struggling”. So, I came back and said “ok”. I needed to re-record everything, re-record the intro, and do all this stuff. It was harder but, I did it with all this energy and joy because I knew I was on mission. Fit Faith Freedom is about moving through the feminine and that intuition part of you, of us. Sometimes we don’t listen to it but, I have learned to trust it so much! So much happened in my life since I’ve started listening to my intuition. What started to pop up after I starting making that faith more a part of my business is I found a podcast by Chris Harder called “For the Love of Money” and he had a guest name Joel Brown. So many serendipitous things led me to listen to Joel Brown who was talking about faith and business in his podcast called “Addicted to Success”. That drew me in. I listened to this one podcast in where he said he was doing a retreat in Bali and to reach out to him for an invitation. I reached out and now I’m going to this retreat in Bali on July! So, I’m going to Bali next month for a business retreat! There’s so much more that will be coming out after I return from Bali. I’ll talk more about my trip and I’ll be interviewing more guests on my upcoming podcast. Listen to your spirit and take action in the direction of your vision. This podcast was about inspiration and motivation so you can take action today. If there is one action you can do that you know will take you closer to your goals, do it right now! Whatever that is for you, take action on it now! Inspiration means nothing without that action. I knew I was called to do my own retreats in person so, I am hosting my first women’s retreat in Raleigh, North Carolina called Beautiful Power on July 14, 2018! It’s a 6-hour intensive retreat, taking my 5 years coaching and mastermind experience and my life’s journey and giving it to you! You will find ways and spaces to up-level. I have some things that I can give and share with you to get you on your path. So, check out the link and apply. It’s on July 14th and if you apply before June 20th, 2018 you will get the early bird pricing! Beautiful Power Retreat: Sign up today for Early Bird Pricing!